Glenmore AC AGM took place on February 25th , 2016. The Chairperson, Rose White, Secretary, Irene Brady & Treasurer, Jim Clerkin all addressed the AGM in their reports & election of new officers took place. In her address the Chairperson thanked all current committee members & all the coaches for their good work and encouraging all athletes. In her address the Secretary outlined the tremendous work done by the club throughout the year such as Bushformation 2015 in conjunction with Bush Post Primary School, the hosting of the Special Olympics North Leinsters on 16th May, Glenmore Challenge’ 10 mile road race on 13th June, Kearney & McBride 6km road race, Carlingford 5km road race, the charity walk for Goal raising €820 on St.Stephens day, the Cooley Credit Union sponsored races, Community Games, Louth Track & Field championships and Setanta games all held at Glenmore track. All the races were a great success and our athletes performed excellently. Thanks were extended to all who make the club a success from coaches, members, parents & athletes to bus drivers, local landowners who allow us to use their land, those who donate to club & support our fundraisers. Our athletes are the most important part of the club and everyone should encourage and praise them. There is so much benefit a child can get by joining an athletic club from friendship; fun and fitness they also learn team work. Team work played a key role in Glenmore winning the Johnny Mullen Cup this year. We would also like to commend the senior athletes who have been instrumental in helping to organise races & in promoting the club. Please see www.glenmoreac.com for further details of the AGM. The following are the new committee: Chairperson, Rose White, Vice-chairperson, Francis O’Reilly, Secretary, Irene Brady, Assistant Secretary Juveniles, Melissa McCoy, Assistant Secretary Seniors, Kinga Byrne, Competition Secretarys, Rose White & Joan Stewart, Tresurers, Jim Clerkin & Lorraine O’Reilly, Registrar, Lorraine O’Reilly, Website design & maintenance, Eamonn Conlon, PRO, Grainne White, Assistant PROs, Amanda McCarragher & Vicky Leahy, Photographer, Tony Brady, Athletics gear, Joan Stewart, Corinna Campbell & Marie O’Connor, County Board delegates, Dermot Barry, Owen O’Reilly, Coaches, Joan Stewart, Gavin White, Francis O’Reilly, Patrick O’Reilly, Paddy Gill, Aaron Cumisky, Anne marie O’Neill, Kenneth McBride, Fiona Finan, John Doyle, Millie Gray, Child Protection Officers, Patrick O’Reilly, Joan Stewart, Welfare Officer, Mary Quinn, Facebook, Kinga Byrne, Committee members: John Daly, Marie O’Connor, Corinna Campbell, Fiona Finan, Kenneth McBride, Melissa McCoy, Gerry Stewart, Kinga Byrne, Vicky Leahy, Annemarie O’Neill, Francis O’Reilly, Dermot Barry, Joan Stewart, Patrick O’Reilly, Ronan Traynor, Michael McShane, Lorraine O’Reilly, Jim Clerkin, Irene Brady, Rose White. Congrats to Shane Toner who came 3rd in the Fitzers 5km on the 27th February, Stephen O’Connor & Katie Bell, who ran a PB, & to Bushformation 2016 participants Anita Roddy & Edel Connolly and Teressa Keenan who took part in Dundalk 5km Park run. 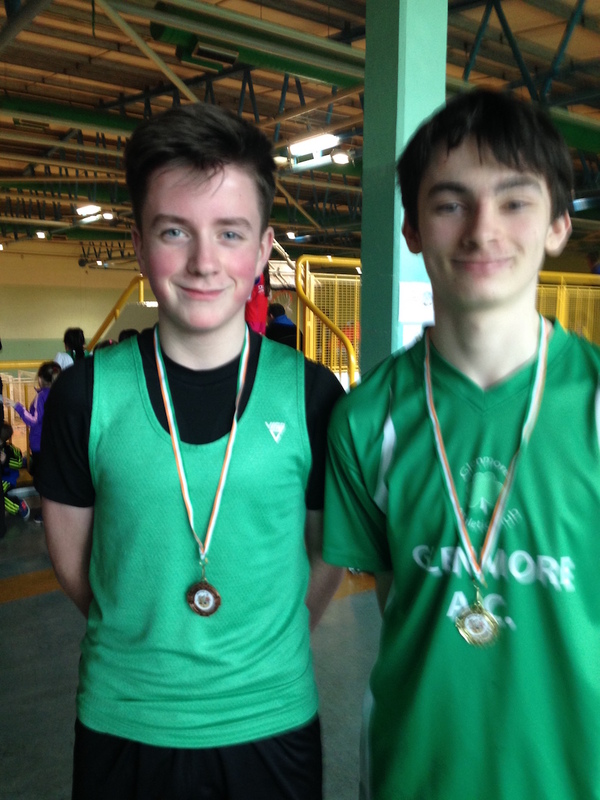 Congrats to the juveniles who participated in Boyne AC Indoor competition in Gormanstown. Jessica White, Katie McDonald, Emma Mccarragher & Mia Ashby competed in U9 300 metres Jessica White claiming the gold medal. They also won the U9 relay gold. They all competed in U10 60m. Ruari Traynor took the bronze in U10 60m. Lucy White, Anna Dawson, Chloe mc Carraher and Ava Ashby won bronze in U11 relay. All girls competed in U11 300m and U12 600m. Cormac mc coy did well in U11 300m. Richard Campbell and Andrew Moore completed a double in the 60m and 600m, Richard won gold in both events, Andrew came 3rd and 2nd respectively.